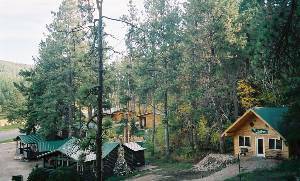 Black Hills cabins near Mt. Rushmore. Perfect location for day trips anywhere in the Black Hills. Mount Rushmore, Crazy Horse, Custer State, less than 20 minutes. Great area for hiking and mountain biking, with Mickelson trail access less than 1 mile away. Be prepared to fall in love with cabin life and return to the Black Hills again and again. 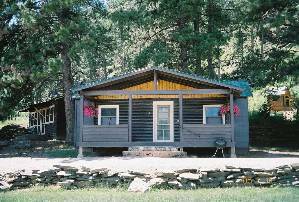 The ambiance of history combined with plenty of modern comforts makes Pine Rest Cabins an ideal place to stay while you visit the Black Hills. 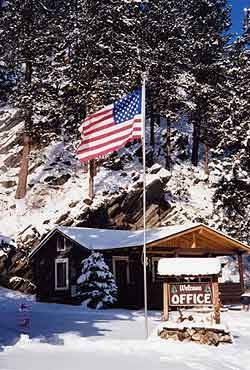 We are 1 mile South of the friendly mountain town of Hill City where you will find excellent restaurants, shops, art galleries, churches, groceries, gas and other services. Rapid City Regional Airport just 45 minutes drive while Denver or Sioux Falls are only 6 hours away. Come visit often and stay awhile. We love it here and are happy to answer your questions and point you to our favorite places. There's plenty to do for all ages and abilities, so join us soon for a great Black Hills experience. Covered porches. Picnic table, playground, volley ball, and board games. Board the 1880 Train in Hill City, ride Alpine Slide in Keystone, fish a local stream or lake, or take a horseback ride in beautiful Custer State Park. These are just a few of the many activities available in the area. The Black Hills is a haven for outdoor enthusiasts - there is something for every age and ability. In the pines with mountains rising directly behind you, yet easy to get to all of the attractions. The Bathhouse Spa is the place to be after a day of outdoor persuits. Fall is our favorite season of the year. The weather is perfect and the colors add that warm glow to every hillside. 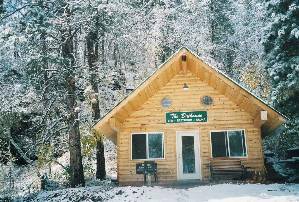 Established in 1911 our cabins have been home to generations of travelers. The Black Hills are spectacular with a dusting of snow, a scene reserved for the winter traveler. ASPEN, BIRCH, CEDAR, and DAKOTA These cabins have been poplular with couples and families alike. Open year round, they feature knotty pine interiors with vaulted ceiling and gas log fireplace. 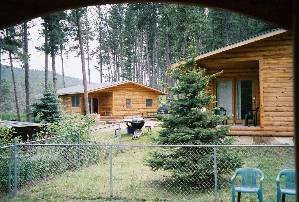 The Three Pines is one of our Four Season Cabins open year round. Recently renovated with knotty pine inside and a gas log fireplace. 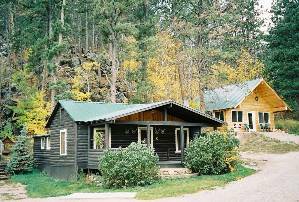 The ambiance of history blends well with the modern comforts of the cabins in the Black Hills. 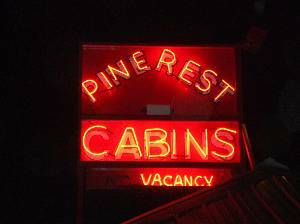 We get away to the Black Hills as often as we can and Pine Rest is the best place to stay . It's a family business, they keep their cabins clean and have a nice laid back , friendly attitude. The beds are so comfortable too. We like the rustic mountain setting, and Hill City is our favorite town - it's been a long winter in Eastern SD - . 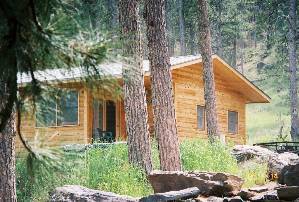 looking forward to our next tripto the Black Hills and Pine Rest Cabins. Andy & the gang. ....how much we enjoyed our time in Cabin 3 ( The Three Pines ) . It really added a lot to our time in S.D. You run a very nice operation. Say hello to Uver the dog. The very best to you in the new year. Rates are subject to change. RATES RANGE from $99 to $699 depending on length of stay ,season, and cabin. We are OPEN ALL YEAR. Please check our website for current rates. Please ask about unadvertised specials and seasonal packages. Romance packages available Fall, Winter & Spring. Cancellations and Refunds: 2 weeks for standard reservations - see home page or call for specifics. Other Fees: 5.5% state sales tax.